The hydrangea flower produces an odor that tends to attract small flies, which over time eat away at the flower's leaves and damage the overall health of the flower. While flies are manageable with the use of insecticides, the potency of the insecticides often damages the hydrangeas in the process. Nontoxic repellents treat the fly problem by safely keeping them from the flowers without harming the plant and can be found in the cupboard of your home. 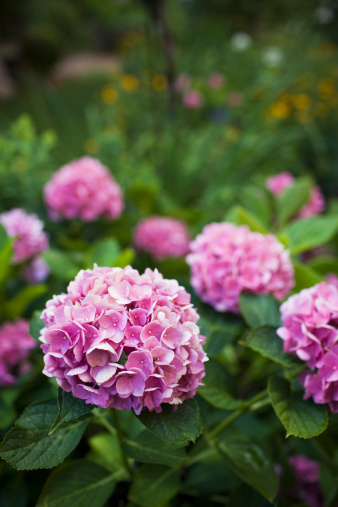 Protect your hydrangeas from flies with natural, household repellents. Place bay leaves in between the hydrangea flowers; their aroma wards off flies. Crush up 1 tbsp. of mint leaves and place them in a small pouch. Place the pouch underneath the hydrangeas, or hang it next to the plant to repel flies. The pungent smell of the mint leaves keeps the flies away from the flowers. Replace it weekly to maintain the odor's potency. Open a container of basil, and place it next to the hydrangeas. Alternately, leave an opened container of cloves next to the hydrangeas to repel the flies from the plants. Pour 2 to 3 drops of eucalyptus oil onto clean cheesecloth. Place the cheesecloth underneath the hydrangea, or hang it near the plant to repel flies. Reapply 2 drops of the oil every 3 days to maintain the natural repellent. Fill an empty spray bottle with neem oil, and lightly mist the hydrangeas with the oil. According to Joe Lamp'l, author of "The Green Gardener's Guide," the neem oil acts as a poison that kills the flies once it is ingested. Use the neem oil as a last resort, as the oil kills all insects that it encounters and may kill ladybugs. Ladybugs prey on whiteflies and are beneficial to plants.